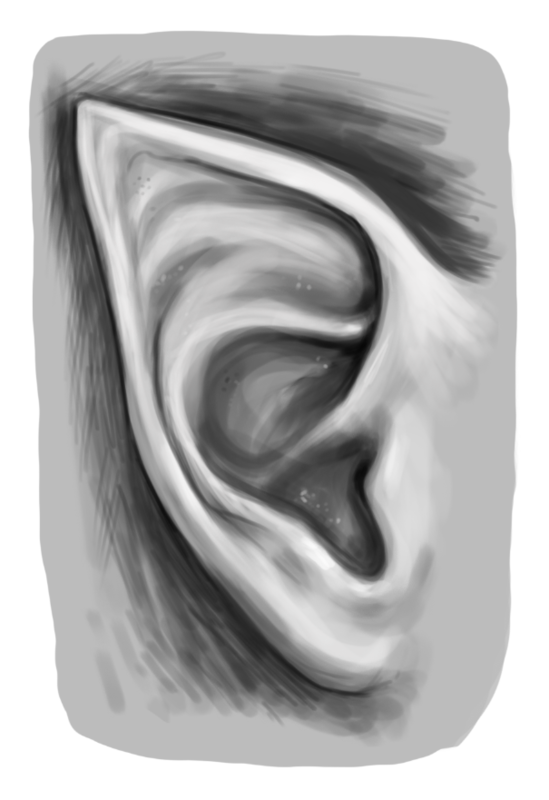 While human anatomy can be tough to master, whether in traditional or digital art, this easy guide gives you pointers on how to draw and shade an ear with the use of a good reference. Use a suitable reference, like this close-up available on the 123RF online library. Ears can be very tricky, so it’s good to have a reference. Granted, all ears are different so alterations can be nice to add. Place the image on your canvas, and give yourself plenty of room for your drawing. 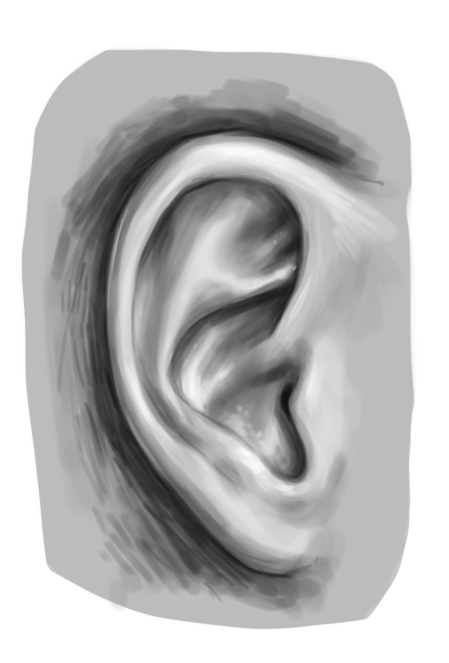 Quickly sketch the shape of the ear. This doesn’t have to be perfect, but get the general outline down and you can edit later. Lower the opacity of this sketch so you can shade on top. To make the shading process quicker, add a light grey layer of color beneath the sketch layer. Make a new layer on the top of the rest of your layers. Pick a light grey that the base color and begin to add in the highlights. This can be basic, just start adding the form to the ear. Now, taking a much darker grey shade in the shadows. As you go, darken the color and increase the depth of the shadow. Doing this slowly and gradually will allow the form to take shape organically. Continue to swap between shadows and highlights, building up the contrast. Once you’ve reached the desired rendering, add in tiny white highlights in the lighter areas, these are to act as the small pores you have on your ears. Lastly, add in the darkest parts in an off-black hue to create the shadows. You can continue to build more contrast or stop at an earlier step, it’s completely up to you. 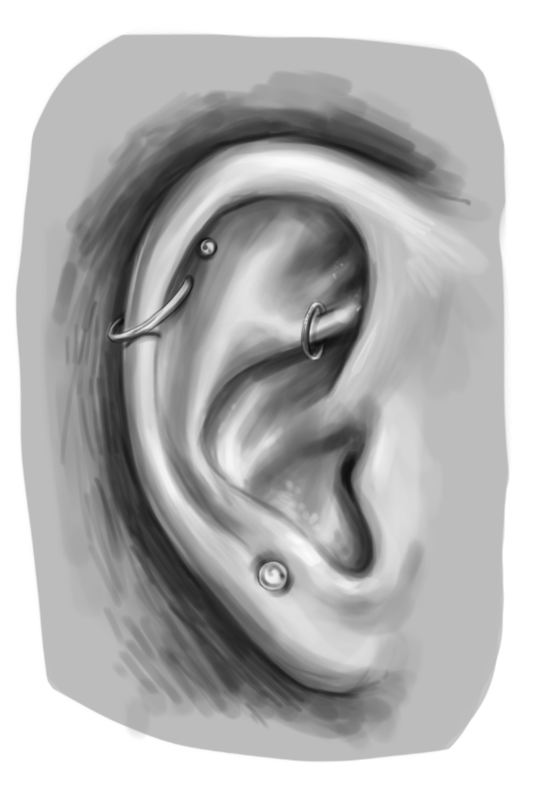 You can even change certain parts of the ear to create more stylized ones, such as elven or fairy ears.